Some 1,500 migrants have been rescued from boats trying to cross to Italy in the space of 24 hours, the Italian coastguard has said. The navy and coastguard despatched vessels to rescue the migrants from five different boats. The UNHCR says almost 3,500 people died and more than 200,000 were rescued trying to cross the Mediterranean Sea to reach Europe last year. The chaotic political situation in Libya has added to the crisis. The coastguard despatched four vessels and the navy another after receiving satellite telephone distress calls from three migrant boats. Two more boats were found to be in trouble when the rescuers arrived. 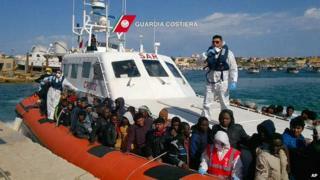 The migrants were transferred to Lampedusa island and the ports of Augusta and Porto Empedocle in Sicily. Last year, Italy dealt with 170,000 migrants who entered the EU by sea. Officials say the numbers for the first two months of this year are up 43% on January and February in 2014. Why is EU struggling with migrants and asylum?